We have built over 85 web and mobile products for great organizations like yours. Check out a few of them below. Don’t just take it from us though - please read the detailed testimonials and ratings from our happy clients on Clutch. FreshWorks redesigned the Grouse Mountain mobile app for iOS and Android, improving the overall user experience and adding innovative augmented reality elements. The app is a convenient way to get the latest information on what’s happening at Grouse Mountain, and features a variety of visitor-friendly elements, including: a summer-winter toggle, a ticket purchasing portal, webcam feeds, event lists, dining locations, grouse grind tracking, and reports for snow, lifts, runs and terrain. Harbour Air required a full redesign of their website to match the look and feel of their brand new mobile applications on i)S and Android. With that in mind, we fully re-imagined the site, creating a modern UX that improved functionality for travel bookings. Wordpress was used and allows the client to manage select content. The site will work in tandem with Harbour Air’s new mobile app, allowing users to simplify bookings across platforms. Harbour Air's native iOS and Android apps were designed with modern UI to improve booking flow. The app allows users to book flights, view upcoming/past trips, and access 360-degree scenic flight videos. Frequent flight options were incorporated (which adapt to user preferences over time), as well as increased customer help sections. Harbour Air’s website and terminal screens were also re-imagined, creating a friendly UX that improved functionality for a remarkable end-to-end user experience and seamless travel bookings. Download now on iOS and Android. Waveband lets people with a wide range of disabilities express themselves musically through movement. By moving an Apple device, users convert motion into the sound of their choice of musical instrument. Users can roll, pitch or turn the device to play a piano scale, shake the device to play a tambourine, and so on. 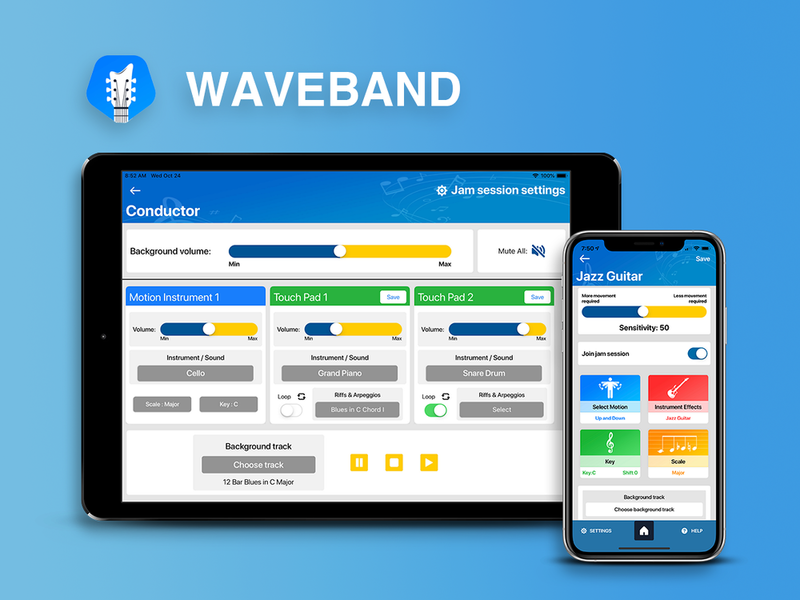 Waveband is completely customizable to ensure that each user's ability to move can be used to its best advantage. Prenuvo wanted an app for clients that have received an MRI scan from the organization. The user can view and download scans completed by Prenuvo onto their mobile device, review reports written by the clinician, and access additional resources directly from within the mobile application. Scans can also be downloaded onto the device for easy offline viewing. The entire app is heavily secured with two-factor authentication and biometric login, to ensure the security of each individual's personal health information. MindShift provides scientifically proven solutions based on Cognitive Behavioural Therapy (CBT), mindfulness meditation, relaxation, mood and anxiety tracking. The mobile app helps you learn to relax, develop more effective ways of thinking, and take active steps to control your anxiety. FreshWorks Studio worked together with Anxiety Canada to revamp the already existing application and add brand new features including: a Chill Zone, Check-ins, Coping Cards, a Thought Journal, and more. SPAAH is the first and only peer-to-peer beauty app in Canada. Available on iOS and Android, the app allows practitioners to connect with clients, while allowing them to set times, rates, and availabilities to help them grow their local audience and customer base. Clients can search their area, book and rate services, and even post their desired spa service to have practitioners reach out to them directly with bids and availability. Playbook Hub is an all-in-one platform for the arts and entertainment industry. The tech provides global reach, exposure and growth opportunities for talent through a single platform, as well as an unparalleled feature-set for agents or managers to book and connect with artists. FreshWorks designed all the UI/UX, and developed the native iOS & Android apps using agile methodology while coordinating with Playbook Hub’s backend team to integrate with their API for payment, searching, profiles etc. The BC Services Card is a digitized version of the government issued BC Services Card. Designed to streamline BC services, the app’s scope includes highly-secure authentication using OpenID Connect, scanning, secure keychain access, JWT signings, RS256 encryption and biometrics to verify user identity. Once a card has been added to the app, it is securely saved to the device and used as an authenticator allowing users to access online government services that require a BC Services Card. The Independent Investigations Office (IIO) of British Columbia is a civilian-led police oversight agency responsible for conducting investigations into incidents of death or serious harm that may have been the result of the actions of a police officer, whether on or off duty. The newly redesigned IIO website now allows users to easily access information on current and past cases. Website visitors can sort cases by area, incident classification, agencies involved, and incident year. Founded in 2003, Used.ca is a free online marketplace for the sale of used goods. FreshWorks developed the native iOS & Android app to exist alongside the website with the purpose of reducing landfill waste. The Used app makes buying and selling goods a breeze. Users can post ads or set alerts and use the built-in chat powered by Twilio. Now notifications, geo-filtering, ad-upgrade functionality, and search filtering can all be accessed from a mobile device. The app provides Compliance Officers with the Environmental Assessment Office (EAO) a tool that can be used in the field or on-site that integrates with work product in EPIC. EAO Inspection App provides officers with the ability to collect data from a site that is used to complete Inspection Reports and allows users to create inspections ’on-the-fly’ (even in offline mode to be connected to project data afterwards). Users can collect photos, inspector notes, and geographic coordinates. Hop Creek Farms, located in the beautiful Squamish Valley, B.C., is a 33-acre farm that sustainably and ethically raises beef, pork, lamb, and chicken. The brand new website has allowed the Wright Family to extend their reach beyond Squamish and enables its users to directly purchase and pre-order cuts of meat directly from the farm that will be delivered upon availability. PetVibe is like Facebook for pets, allowing owners to get social with others in their area. The app is a community where pet owners can connect while offering a place to find meetups nearby, seek and list products and services, or coupons and more. Users are empowered to learn, connect and share with their pets. The app even has a lost and found feature, crowdsourcing from the community to safely reunite owners and their furry friends. The AI chatbot was created as a proof of concept and is an AI form assistant for those filling in divorce forms online. The chatbot uses Watson Assistant, a speech-to-text and text-to-speech service to create an interactive chatbot that can walk a user through filling out a complex government form. Users interact with the chatbot in their preferred language, answering easy to understand questions. The chatbot validates, formats, and translates the answers before placing them into the form's inputs for users. The BC Government, citizens, and other stakeholders needed a user-friendly and easy-to-access directory of all government employees. When DataBC had given the public access to their Government Telephone Directory System (GTDS), our team at FreshWorks identified an opportunity to use two of our core values; Resourcefulness and Collaboration, to find a way to help BC residents access government employee contact information with ease. By using open data from DataBC, this solution became the BCGov Directory iOS application. The City of Victoria app was created to give tourists, citizens and government employees a way to interact with the city like never before through a variety of exciting features. ConnectVictoria allows users to search for jobs, news, information, and events. There's even contact info for residents to submit a service request to report potholes, street light outages and other issues from the app simply by taking a picture and pinpointing the location on a map. With more that 100,000 downloads, BC Highways app is a traffic and driving condition reporting app for BC's Highways. Before you leave home, it shows you road issues on your route and live feeds from webcams. By using information gathered from DriveBC Open 511, the app helps you avoid traffic issues and gets you from A to B safely with informative, real-time updates. This app is free and available on iOS and Android devices, Apple Watch and Apple TV. MyCogHealth is a research platform that combines surveys and brain games to test an individual’s cognitive health over time. The mobile application collects participant survey data while they go about their day to day lives. The researcher portal allows researchers to create new studies and surveys for participants to join with a robust and detailed creation tool, and allows researchers to export the collected data for research purposes. Livecare Connect™ Telehealth Platform improves a clinic’s efficiency, patient satisfaction & schedule flexibility. Connect provides a high-quality, simple video conferencing platform that can integrate smoothly with any healthcare practice. The app (for web, iOS, and Android) has an intuitive interface that allows users to schedule a visit and uses an Oscar EMR plugin for integrated scheduling and visit documentation. Medical grade, HD video also provides the clearest images. Connect fulfills national healthcare security standards (PIPA & FIPAA Compliant). The VanWineFest app lets festival attendees know which wine exhibitors and vintages are on display. In addition to providing detailed information about specific wineries and wines, the app allows users to take notes, share their favourite finds on social media, order and rate wines, and find out about various events happening around the festival. The app also enables wineries to contact users after the event with more information and special offers. UseSafer app is a tool to help alert emergency services in case of overdose. The user of the app sets a timer when he plans to use a drug, illegal or otherwise, which will trigger a countdown and alarm. If the user does not deactivate the alarm within 30 seconds, emergency services are contacted with the user's location and other details. If the user adds contacts to the app, they are also alerted. Pruvit is a mobile solution designed to ensure the accurate and regular flow of information to streamline field operations by handling extensive collected data quickly and easily. Using a rugged inspection tablet, the app is designed for professionals working in the oil and gas fields. It utilizes multiple mobile forms, allowing users to complete inspections directly on the tablet, make risk assessments, and report on data such as the density of oil and gas, displacement, weight, etc.